First of all, I DO know that Steve Benjamin got elected tonight, despite what you read on Twitter and Facebook. My Tweets were taking half an hour to post, and Facebook an hour or two, so people were going huh? over Tweets that made it seem I was still in suspense LONG after the results were certain. Which is embarrassing for a journalist. I had Wyeth Ruthven making fun of me, which isn’t good. But I assure you, I knew what was happening, because I was in the thick of it. That was the problem — reception was lousy in the bowels of the Convention Center. I was at the Finlay “victory” party in Five Points right after 7, when they thought they were going to win because they had won Rosewood, Dreher and Hand precincts. I left for the Benjamin HQ expecting to find dejection, but by the time I was there everything was breaking his way. And I meant it. It was a big moment. I mean, the man had tears coursing down his face as I sent that out. And if you didn’t get a contact high from being in that crowd, you’ve got ice water in your veins. His speech was excellent. I’m going to try to upload the video tonight, but I can’t say “film at 11” because I know it will take MUCH longer than that for the video to upload to YouTube. This entry was posted in Uncategorized on April 20, 2010 by Brad Warthen. Thank God I live in Lexington. Y’all will note… ahem… that one had to take out an ad on bradwarthen.com to win this election. 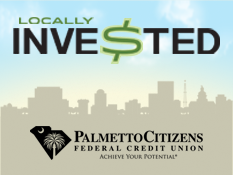 Yes, I know, my very FIRST advertiser, Tony Mizzell, lost — but he and Leona (my very SECOND advertiser) both advertised, and it was impossible for BOTH to win. Nice photo. The dude looks anointed. And forgive my ignorance, but does Steve Benjamin have a party affiliation? You wouldn’t know it from his website and tonight’s news stories. 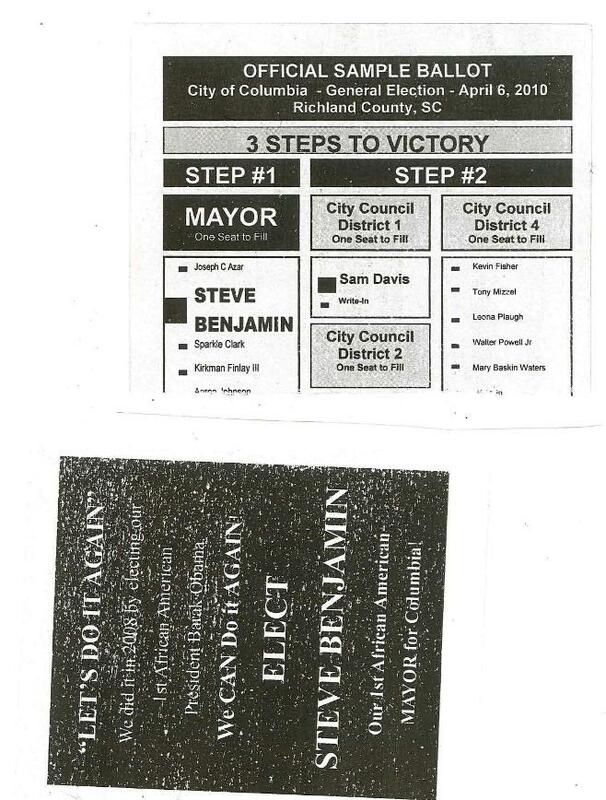 why did benjamin’s campaign distribute fliers to all the black churches in columbia saying “We did it in 2008 by electing our first African-American President Barak Obama. 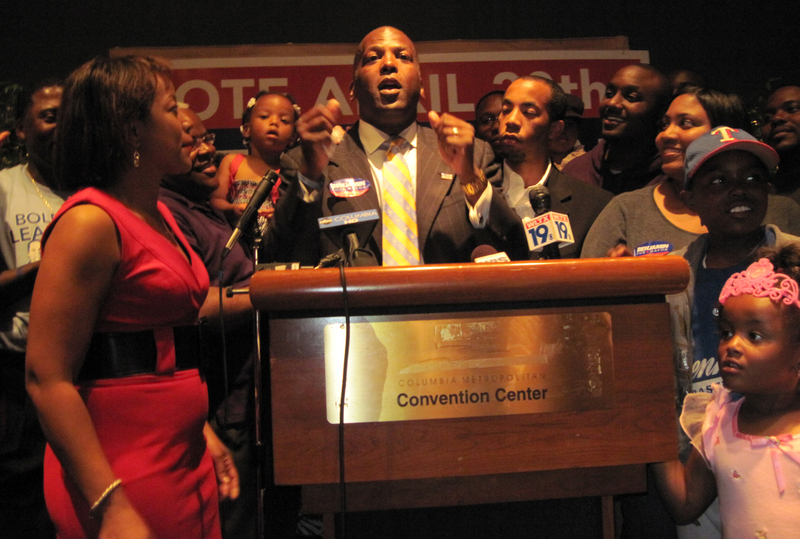 We CAN do it AGAIN – ELECT STEVE BENJAMIN our first African-American MAYOR for Columbia.” if race doesn’t matter? So Justin — you’re saying they misspelled “Barack” — or was that just you? LOL back atcha. Burl, Columbia city elections are nonpartisan, which is why you don’t see references to party. But outside the context of this race, Steve’s a Democrat. He was the Democratic Party nominee for state attorney general several years back, and held a Cabinet post under a previous Democratic governor. 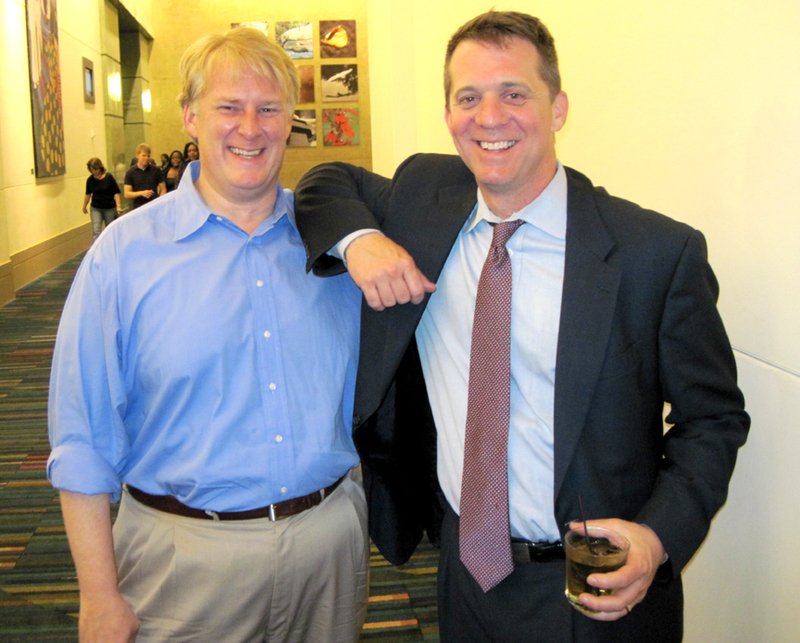 And it’s pretty remarkable that the Republican Quinns (see photo above of Rick Quinn, with Democrat James Smith) worked to get him elected, but they did. A Democrat and a Republican working together?! They’ll BOTH be anathema to their respective parties! But that sounds wonderful to me! It’s the most redemptive thing/event I’ve seen or heard tell of in SC in years! Ahem. Brad? I do think these results also indicate that if you irritate the Shop Tart on soccer day, you will lose the election. Just saying. I’m kinda teary reading this post. Good job, Brad. Although a poor scan, Barack is indeed misspelled “Barak” on the flier. kthx! Why would a Republican political consultant align himself with a Democratic mayoral candidate? It’s all about the Benjamin$. It’s always about money when it comes to politics. When people measure their self-worth by looking at their checking account balance, you get the government we have. Justin, all I can say is, “Uh-huh. What’s your point?” We’ve already had discussions here in the last couple of days about people voting for and against candidates because of race. And I certainly hope the sophistication of our discussion has gone beyond such pseudo-naive assertions as “imagine, though, for a moment what would have happened if anonymous sample ballots like this were printed up on behalf of a white candidate?” (That’s from the link you provided.) Are there really any unreconstructed white folks out there who actually still think that is some sort of profound, meaningful observation? Sorry that it disturbs you that some black folks might be proud and feel validated when someone in their demographic group wins an election for the first time in history, when so many of them can remember when leading politicians in South Carolina deliberately and openly advocated for preventing them, on the basis of their skin color, from fully participating in public life. I feel stupid and trite even pointing out such things (but how else to respond to such a statement as that quoted above? ), and frankly irritated at anyone whose reaction to an inspiring and uplifting moment that means so much to so many people’s hopes and aspirations (of different kinds) with a derisive “LOL.” What’s with you, really? Why do you have this to tear down and snort in derision when other people are happy over something they see as a blessing? Steve Benjamin got elected because many different people agreed that he was the best candidate. That means some Republicans joined with a lot of Democrats and independents to elect him. (In fact, from the beginning, the person who contacted me the most in Steve’s behalf was McCain friend and supporter Jack Van Loan.) It means lots of white voters joined with black voters to choose him, and I suspect that among the many reasons those whites chose him was that they thought it would be good to break for once with the pattern of 100 percent white mayors. Personally, the emphasis on race is a negative for me. I sort of grimace when I see yet another news story about first this or first that, because I believe it cheapens the person in question, ignoring that he has qualities that make him the better candidate regardless of race. If you’ll recall, I don’t see Barack Obama as America’s first black president, because I don’t see him as black in any way that is politically meaningful in this country. (Not only is he half-white and raised by whites, but he doesn’t have a single ancestor who was brought to this country as a slave, which puts him entirely outside this country’s narrative on race. In fact, as I wrote in my column “Barack like me,” I see his background as having more in common with my own than with those of most black Americans.) Of course, that perception on my part doesn’t keep me from being appalled at people who DO see him as “the other” and seem to reject him on that basis. But then, I’m a white guy. I haven’t spent a lifetime as a black man watching only white guys get elected to this job. But I can take satisfaction in the fact that when the candidate widely perceived as the best candidate just happens to be black, he gets elected. And I can see how a black person, seeing that chance, would want to volunteer or pass the word or otherwise pitch in and see that he does get elected. And I can see white folks doing it, too, wanting to see the historic moment happen, so that we can move on and not have to worry about a candidate’s race ever holding him back in the future. That’s another measure of Benjamin’s broad appeal, by the way. Just as he got both Republican and Democratic votes, he got the votes both of people (mostly, but not all, black) who passionately desired to see a black man win, and of people (mostly, but not all, white) who already see our society as post-racial, and wouldn’t dream of emphasizing a candidate’s race. And that’s what happened here, and what is being celebrated. And if you actually can’t see that — worse, if you just don’t want to see that (or worst of all, you see it and are displeased by it) — then I’m sorry for you. Look, whoever put out Steve’s email blast today misspelled DeAndrea’s name. It happens. @Doug–I do believe you have conflated “some” and “all” again. Rick Quinn is a professional campaign consultant, so being for hire is part of what goes along with that. Quinn & Associates may or may not be as you suggest. I don’t think that you made your point with very strong evidence this time. I do have to say that I get annoyed when people criticize people for whom they represent professionally, or for reporting what they see when they are bloggers, etc. I grew up in Salaryland, where everyone’s dad just went to work and did research-related activities (albeit in furtherance of nuclear weapons production for our national defense during the Cold War). It’s kind of easy to sit back and kibbitz when your meal ticket comes in a nice clean envelope. Some jobs are just a bit “dirtier” than others. Mine certainly is. And you know what? I’m STUNNED to discover that I actually like having to deal with going out and getting the money. Or rather, I like getting the money enough not to mind going out after it. This stuns me because the very thing that you describe — getting a salary week in and week out, without it having a direct connection to one’s activities — was something I had all my life until last year, and thought it was really important to me. I’ve always hated thinking about money, which is why my wife pays the bills and manages the bank accounts and files the taxes. At the paper, as my staff shrunk and we kept having to redistribute duties, I made sure that I always raised my hand to do ANYTHING other than manage the budget (poor Warren, to whom I gave that development opportunity). I wanted to DO THE JOB, and know that X amount would always appear in my bank account like clockwork. But I find I actually enjoy making the money — I even get a kick (from the novelty, no doubt) from making the pitch, from working into otherwise casual conversations “You read the blog? Great! And you have a business? Congratulations! Have you thought about putting the two together?…” In fact, I did that with someone I met half an hour ago. Part of the appeal is that I’ve always liked doing new things. My one beef about having worked my way into a position that could only be held by someone who had concentrated on journalism for a couple of decades was that it meant I couldn’t … practice law, or medicine, or direct music videos, or do something else fun. Learning that it IS possible to live, and enjoy life, without that big taken-for-granted paycheck underwriting it all, having to hustle instead, is a big revelation. I guess having never made a “dirty” dollar in my life, I don’t know how that world works. I hope I never have to enter that world. But I am also very familiar with what ethical concessions are made in the political arena. I saw what people were willing to say and do to win a school board position in Richland 2 firsthand. This was for a job that paid $500 a month. It doesn’t take a big leap to extrapolate what people are willing to do and to spend to attain positions of greater influence. Being in charge of hundreds of millions of tax dollars can be very lucrative. Unfortunately, the general public is either too apathetic to care or else too willing to lower their standards to elect people who are either a little “dirty” or who hire people who are a lot “dirty” to do their dirty work for them. I’ll measure Mr. Benjamin on the results he achieves. We do need to keep an eye on the people who are in positions of power and who control the public purse. I believe most of us who read blogs like Brad’s are doing the best we can to do so. I have been annoyed since law school at the people who love to make lawyer jokes of the sort that simply assume we are all crooks or otherwise worthy of immediate extermination, yet are more than happy to mooch free legal advice when the need arises. Lawyers do so much of the “dirty work” of sorting out people’s bad decisions, for example, yet those lawyers come in for the brunt of the snide remarks. I mostly did “clean” work like making sure the factory being financed was actually on the land it was supposed to be on, and making sure that the business deal struck was accurately reflected in the contracts. For a brief period, though, I did “dirty” work, like reporting on parenting skills in custody cases, and ensuring that juveniles accused of offenses got appropriate treatment. Several of those former juvenile clients are now dead. I hope that the work I did as guardian ad litem resulted in the best outcome for the children and parents involved, but it was hard to be sure. Comes with the territory, but it doesn’t feel good when it happens. All I can say is that anytime that an election is won based on the fact that a candidate is of a certain race is sad. It is a bastardization of our political system. Please don’t give me a history lesson on how Columbia has always had mayors of white skin color. Or even how the US has always had presidents of white skin color. I have no qualms with Benjamin. He may be the best mayor this city has ever seen. But, the fact that he won this race based upon his race, that’s something I will ever respect. Aren’t there more white voters than black voters in Columbia? If so, then Benjamin’s appeal crossed racial lines into the competency sphere. Well, no. In Columbia, I think the electorate became slightly majority-black a couple of years back — although in the normal course of things, white turnout is probably still higher. Richland County has a high-enough black population to be predominantly Democratic. Democrats generally win this county, while Republicans ALWAYS win Lexington County, over across the river where I live. You have to remember that South Carolina had more slaves than free people before 1860. It was, at least some of the time, the highest slave-population state in the U.S. So, in spite of the migration north in the early part of the last century (in search of industrial jobs), there are still broad swaths of SC where counties are majority black. And those voters were very much energized by the Obama campaign, which helped fuel a generational phenomenon — 2008 was the first time in many a year that the turnout was greater in the Democratic primary than in the Republican. And Justin — the point is that Steve Benjamin wasn’t elected “because” he’s black, or “because” he is a Democrat, or “because” he articulated a vision people liked, or “because” he’s personable, or “because” he’s a good speaker. All of those things played into it. And you know what? If he’d been white, I firmly believe he’d have been elected, and we wouldn’t be having this conversation, because we wouldn’t have a black electorate all excited and proud. I’ve followed these guys for some time, and Steve Benjamin more closely than any (because he’s run longer and harder than any), and had he been white, I’d have been VERY surprised if he hadn’t won. He’s a more compelling candidate, and a more persuasive one, than Kirkman or Morrison. Being black was an additional characteristic that helped him with some voters (which offends you) and hurt him with others (which you may not believe, but you’d be wrong). A white Steve Benjamin would have won this election. “Figures from the U.S. Census Bureau show Columbia’s black population actually has decreased in the past few years. It was 46 percent in 2000. A Census Bureau survey conducted from 2006 through 2008 showed the black population had dipped to 42.8 percent – roughly on par with where it stood in 1990.